Melaleuca offers Loyalty Shopping Dollars as a reward for being a loyal customer Any customer with a minimum 35 product point commitment may participate. Most Melaleuca products can be purchased with Loyalty Shopping Dollars. Loyalty Shopping Dollars are not earned on Backup Orders. When you check out, look for the check box to "Loyalty Shopping Dollars". 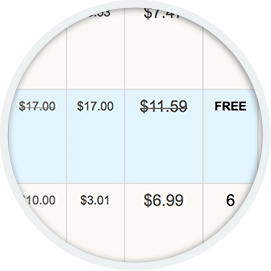 After you have checked the box, your cart will be instantly updated to show the discount. 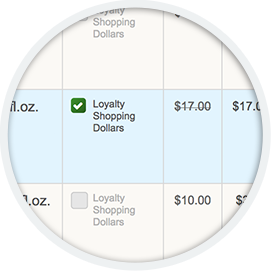 You must meet your Product Point commitment in order to checkout with Loyalty Shopping Dollars purchases. Products purchased with Loyalty Shopping Dollars do not count toward your product point commitment. Loyalty Shopping Dollars cannot be used to pay for shipping, handling or tax on products. There is a $1 redemption fee when you use Loyalty Shopping Dollars. Loyalty Shopping Dollar redemptions can only occur with a minimum Product Point order and a $1 handling fee, applicable shipping, and taxes will apply. No Product Points will be given for products purchased in whole or in part with Loyalty Shopping Dollars. Earn 10% in Loyalty Shopping Dollars by shopping online from the 1st of the month through the 25th. After the 25th, earn 5% back by shopping online. Earn 5% in Loyalty Shopping Dollars when you order via fax, phone, or mail before the 15th. Phone, Fax or mail orders placed after the 15th will not earn Loyalty Shopping Dollars. Sample Reward Calculation: Placing a 71 point order online before the 25th earns you $7.10 Loyalty Shopping Dollars (71 points x 10%). Get even more of the great products you love for free! Enroll in the new Learn to Earn program and earn up to 15% back in loyalty Shopping Dollars when you shop and watch videos. That is a 50% increase from the current Loyalty Shopping Dollar program! Sign up now! Earn 15% in Loyalty Shopping Dollars when you shop before the 20th of the month. Earn 10% in Loyalty Shopping Dollars when you shop after the 20th. Sample reward calculation: Placing a 71 point order before the 20th earns you $10.65 Loyalty Shopping Dollars (71 points x 15%). The dollars you earn will now be available to activate by watching videos in the Learn to Earn Gallery. Once activated, your dollars are immediately available to spend on your next order. Customers in their first 5 months can earn up to $100 Loyalty Shopping Dollars by watching short videos and answering a few simple questions. Earn all $100 at any time during your first 5 months as a Melaleuca Preferred Customer.